Manny “Pacman” Pacquiao, the number one pound-for-pound boxer in the world, is a very courageous, kind-hearted, strong, and faithful man. I’ve never known such a man like him who is very dedicated not only to his boxing career, but also to his fellow Filipinos as well. Manny Pacquiao is a great fighter and a hero to us. Even though he has gained a lot of achievements in his boxing career, he has never forgotten to help his fellow Filipinos and has always remained humble and kind. Pacquiao is not just a fighter but also a religious man. Whenever he has a fight, he never forgets to say his prayers, thanking the Lord for the opportunity to fight. In addition to this, he is also thankful for the good health he has and for all the Filipinos who are always there to support him, whether rich or poor, young or old. Moreover, even after his fight, he goes at the corner of the ring to say his prayers once more. 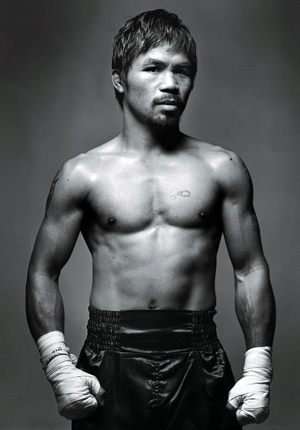 Pacquiao is the first Filipino boxer in the history who won seven world titles in different weight divisions. He has become great in his own way. He never gave up on anything. He has endured many things throughout his life — from the experiences he had since he was young to his well-established boxing career. These challenging experiences molded him to be a good fighter, as we now all know of — no wonder he’s been called “the greatest Filipino boxer of all time”. 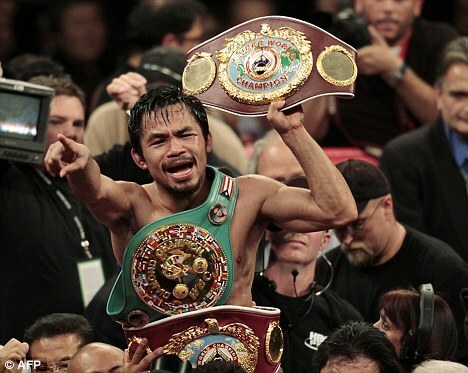 Manny “Pacman” Pacquiao wins again! Once again Manny Pacquiao proved to the world that he’s the pound-for-pound king in the boxing ring! Pacquiao defeated Miguel Cotto in a 12-Round fight in Las Vegas, Nevada last Saturday and got his 7th title in WBO. Manny Pacquiao is indeed the best fighter in the boxing ring! He is the pride of the Filipino people. He is our inspiration and our strength. Thank you to Manny Pacquiao for everything he did to make the Filipino people happy! Attention to all Manny Pacquiao and Ricky Hatton fans! The planned showdown of Birtish boxer Ricky Hatton between Filipino pound-for-pound king Manny “Pacman” Pacquiao on May 2, 2009 at Las Vegas was called off after the two boxers’ camps couldn’t agree on how to split the profit. Manny Pacquiao decided not to sign because he was unhappy with the terms. He wanted to have a bigger split of the profits but Hatton’s camp didn’t agreed. So, that’s it! No fight between Pacquiao and Hatton. Manny Pacquiao no match for Ricky Hatton? Eric Morales a Mexican boxing hero that was defeated by Manny “Pacman” Pacquiao in their 2005 & 2006 fight said that Pacquiao will have no chance against Ricky Hatton. “Hatton has a good punch and he’s fast,” Morales said in a Mexican paper Esto. Hatton and Pacquiao are all set to fight in a big showdown on May 2, 2009 with the British slugger putting his 140-pound IBO belt on the line. Another boxer, welterweight Carlos Palomino, now 59, has issued an early forecast, and like Morales is betting on Hatton. “At 140 pounds, I think Hatton is too strong for Manny. He’d put too much pressure on Manny,” said Palomino, who lost his welterweight crown to Wilfred Benitez via a 15-round decision in 1979. I think Manny still has a chance to win against Hatton and we all know that Oscar Dela Hoya was defeated and forced to give up after eight rounds in their 147-pound match right? Manny is the champion of the champions. He is young, fast, strong and a great fighter. If He wins then He’s the Champion of all time! He has his pound-for-pound title, a nine-match winning streak and a reputation as the greatest, most exciting fighter today on the line.